Mindset is something that everyone struggles with from time to time. Whether you are experiencing a lack of confidence or stuck with an “imposter syndrome” mentality, you have the power to change your mindset. Offering a new service, raising your prices, or entering a new market can all be triggers that can set off mindset issues. 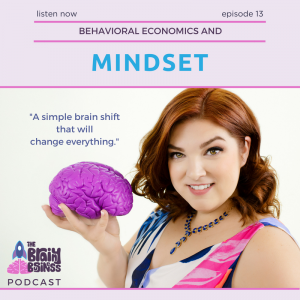 Today, I talk about how behavioral economics plays in, and how you can adjust your mindset by overcoming a couple of aspects where your brain is contributing to mindset problems. I talk about vicious/virtuous cycles, the confidence/competence loop, and how to shift your outlook. Of course, this episode features research and real life examples to help cement the concepts of this behavioral economics podcast. CLICK THE IMAGE TO WORK WITH ME! [03:16] Everyone struggles with mindset issues occasionally. [03:32] Imposter syndrome is when you feel like a fraud. Experts estimate that 70% of people have felt this from time to time. [04:05] You could also have a lack of confidence around pricing or your offering. [04:23] I’m going to help you create a simple shift to break out of mindset problems. [04:39] A vicious cycle is where you get stuck in a downward cycle. Your brain fixates on small problems and makes them seem bigger. [04:58] There is also a virtuous cycle. This is good piling upon good. [05:15] The confidence/competence loop is a great example of this. [05:28] Confidence matters when it comes to sales. Being confident is what closes deals. [05:49] As you get more confident – you gain competence. [06:16] A real-life example of this virtuous cycle is when you increase your pricing and get so comfortable sharing that increased price that you are saying it like you are saying the weather. [06:49] Practice in the mirror and say it out loud until you really begin to own that price. [07:05] You need to do this because your buyers subconscious brain will pick up on the slightest hesitation. [08:03] I talked a lot about mindset in episode 10. I shared a story where I was hired as a reservation agent at Alaska Airlines when I was 18 years old. [08:42] My training was extensive. This job prepared me for the future. When you quote someone a price it doesn’t matter what that price is. And it doesn’t matter whether you would be willing to pay that price or not. [11:00] You need to sound confident and say that price as if it was nothing. My confidence could greatly impact the close rate for the airline. [12:04] A price is a price. I would read my script over and over all day. [12:29] Say it with a smile and wait as long as it takes. I was outwardly confident and calm. [13:22] At my first agency job, I learned how to quote high hourly rates. Always remember that you are worth your hourly rate. It was chosen for you for a reason and never doubt your worth. [16:22] You need to feel like you are worth it whenever you walk into a pricing situation. [16:43] The behavioral economics of mindset specifically around anchoring & adjustment and relativity. [17:32] Do not set the wrong anchor. We are exposed to more content in the social media world. [17:56] Don’t think you can’t launch until you meet some minimum standard. [18:22] Don’t set your anchor against people who have been in business for a long time and have a giant team of people. [18:41] People who have the money to create a lot of content also have the money to create a lot of ads. This is why you are constantly seeing their information. [19:24] Reset your anchor and adjust down to a level that you and your clients can accept. [19:59] What are you presenting to the world while you are waiting for perfection? [20:31] The small steps approach applies to mindset, as well. [20:46] It’s better to take one small step today than to sit and dwell on the big picture. [21:44] If you are taking small steps, relative to yesterday or the day before you are doing awesome. [22:52] I want to help you adjust your anchor to be on the reality of what you are doing instead of on what other people are doing. [23:33] When in doubt look to Dr. Seuss. [25:02] I love helping clients, and working with an expert can be the jumpstart you need to get unstuck. Remember – 10% off virtual strategy sessions and the October Workshop are only available through the end of the month.